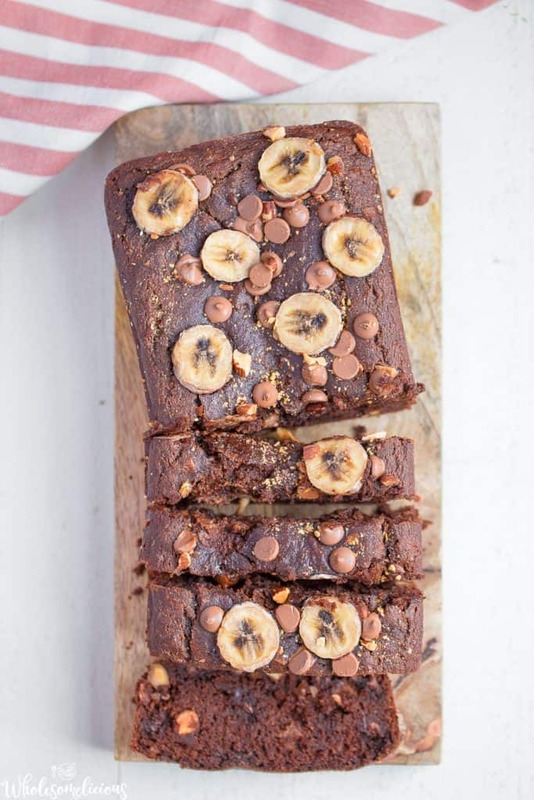 This Double Chocolate Banana Almond Bread is full of absolute deliciousness!! 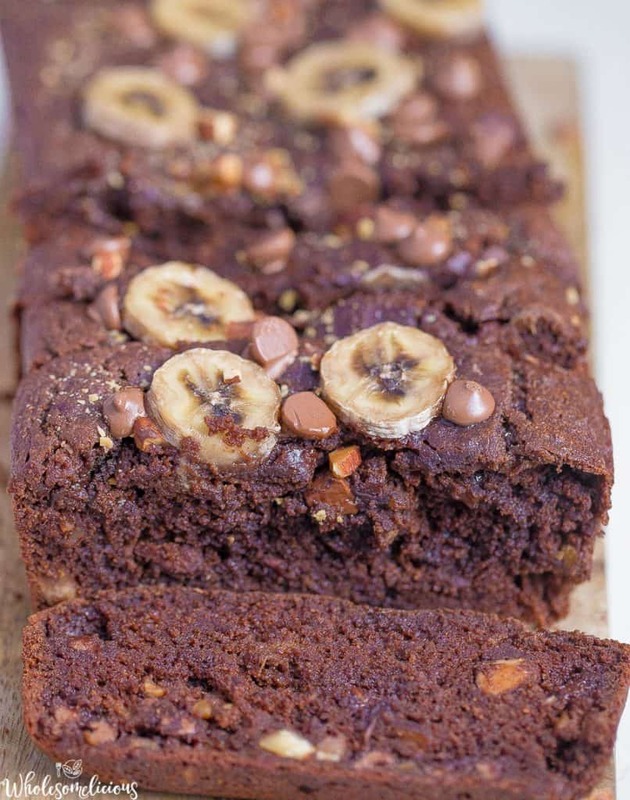 You’ll love the fudge-y chocolate texture, sweetness of banana, and crunch of the almonds. 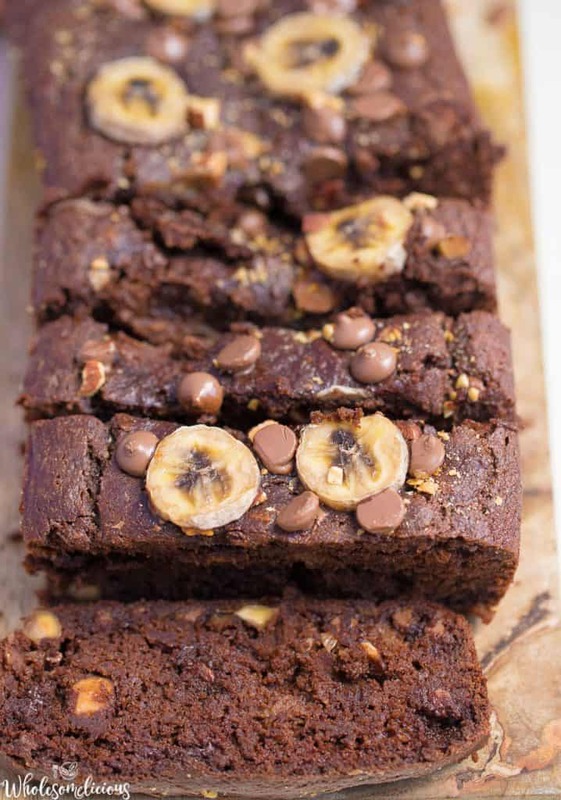 All made without refined sugar and grains for a healthy Paleo treat! Did you know that February is the month of chocolate? I’m not really sure if that’s true, I kind of just made that up. I’ve sooooo had chocolate on the brain after pretty much going the entire month without it. January is generally a squeaky clean month for me when it comes to food, and although I didn’t do a complete round of Whole30, I tamed that chocolate beast. I’m pretty proud of myself. So proud, that I’m celebrating. 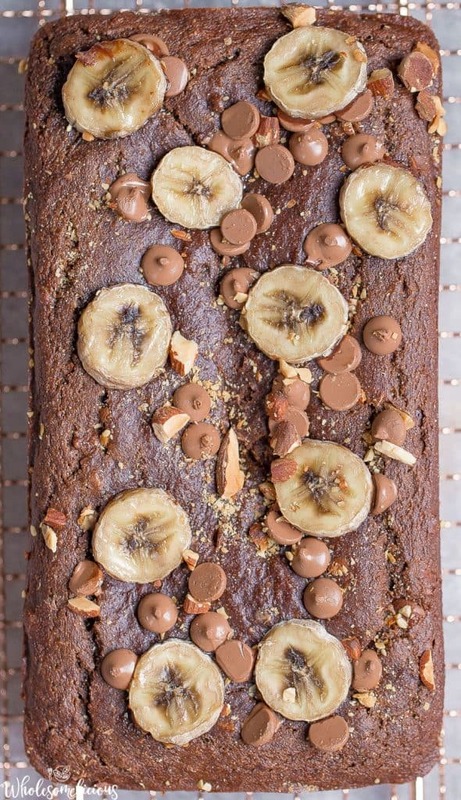 I mean, duh, what better way to say “hello February!” then with a loaf of DOUBLE Chocolate Banana Almond Bread? I’m pretty thrilled with how delicious this turned out. I’ve combined cacao powder with extra chocolate chips, some chopped up almonds, mashed bananas. 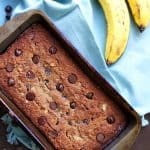 All naturally sweetened with just a touch of maple syrup, ripe bananas, and almond butter. The almond butter is a nice touch because it means that I didn’t have to add in additional oil to give the bread a perfect moist texture. So what shall we do with this bread you might ask? Breakfast? Lunch? Snack? Dessert? I’m glad you asked. The answer is simple. All of the above! 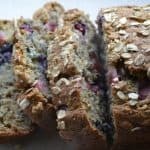 I feel good about giving this to my kids with breakfast because it is packed with almond flour, almonds, and almond butter that gives us a boost of both protein and good fat. 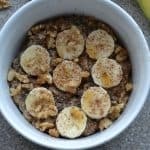 Nutrient dense breakfasts like this are sure to keep them fuller longer. It’s also going to be my sweet treat tonight, and going in the lunch boxes tomorrow. So many ways to enjoy it! And if you are wondering if you can replace the almond butter or chopped almonds with a different nut (or nut butter), the answer is sure. Have at it! Begin by preheating your oven to 350 degrees. Spray a 9x5 loaf pan with non-stick spray, or use parchment paper as a sling over the long edges of the pan. Set aside. In a large bowl, mix together your dry ingredients: flour, cacao, baking soda, salt. In a smaller bowl, whisk together your wet ingredients: eggs, almond butter, syrup, extract, milk, and bananas. 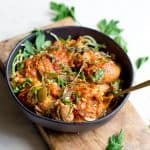 Now add the wet ingredients to dry, use an electric mixer to combine, scraping all the dry ingredients along the side of the bowl. Now fold in chocolate chips and almonds. Pour the batter using a rubber spatula into the loaf pan. Smooth out the batter so it's flat. Top with additional chocolate chips or almonds (optional). Transfer to the oven and bake for 45-50 minutes (depending on oven) at 350 degrees. Remove and check if ready using a toothpick inserted in the center. 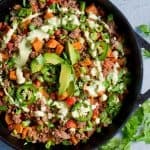 Let cool in the pan for at least 10 minutes. Use the parchment paper to remove the bread from the pan. Let cool for at least another 10 minutes before slicing. Can be stored at room temperature in an air tight container for a few days. Or stick in the freezer for up to 1 month. 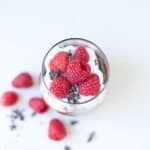 *To make this recipe Paleo, use Paleo approved chocolate chips such as Enjoy Life Foods. Made this. Love it. I bookend my days with this… a slice in the morning with my coffee, and a slice at night with my Vanilla Rooibos tea… A.Maz.Ing. 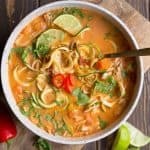 Hi loving all your recipes,thanks for sharing. I was wondering can I replace the maple syrup with dates? Sure, I don’t see why not. Let me know how it turns out! Can this be froze and thawed later?